Our KISS Gene Simmons Mr. 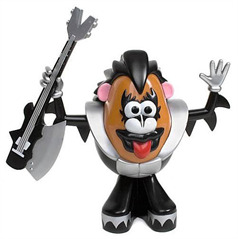 Potato Head features Gene Simmons Mr. Potato head, ready to rock kiss-style! The demon- gene Simmons! Introduction for future Fans of kiss! This kiss gene Simmons Mr. Potato head stands about 6-inches tall, the perfect size for Playing or proudly displaying. The gene Simmons Mr. Potato head is packed in a colorful window display Box and includes a variety of costumes, instruments, hairstyles, faces, and more. For your rockstar niece or nephew.